I always love the view from a rooftop of a building, as usually I could get a 360-degree view of the surrounding. I would love it more, if at the rooftop there is a restaurant or a cafe, so I could enjoy the view while having my meal. Just like the Morning Glory Coffee Bandung, or let’s short it to Morning Glory Bandung. Morning Glory Bandung has some outlets already in Bandung, but the one that is located on a rooftop is the Morning Glory Coffee at Mitra Hotel located in Jalan WR. Supratman, Bandung. 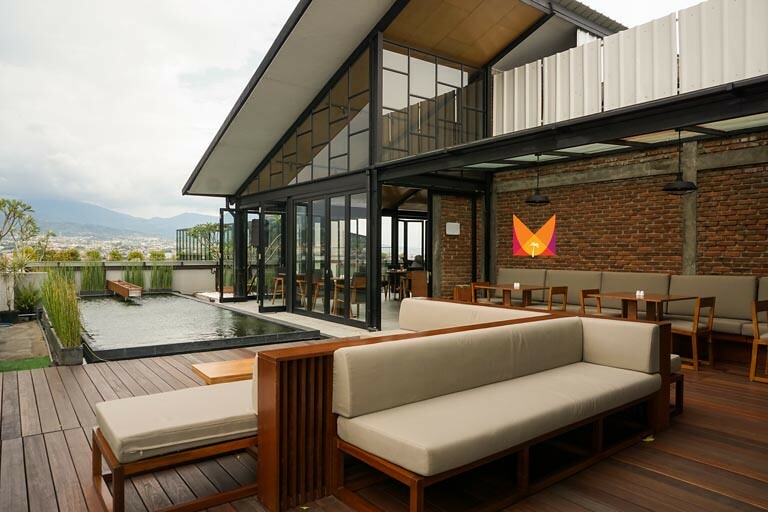 Why I love this rooftop cafe? The rooftop is at the 6th floor of Mitra Hotel. At first I thought it’s a bit too short for a rooftop? But I was wrong. There is no tall building around the area of Mitra Hotel, so there is none blocking the view. Thanks goodness for that! Look at this beautiful view from the rooftop of Mitra Hotel. 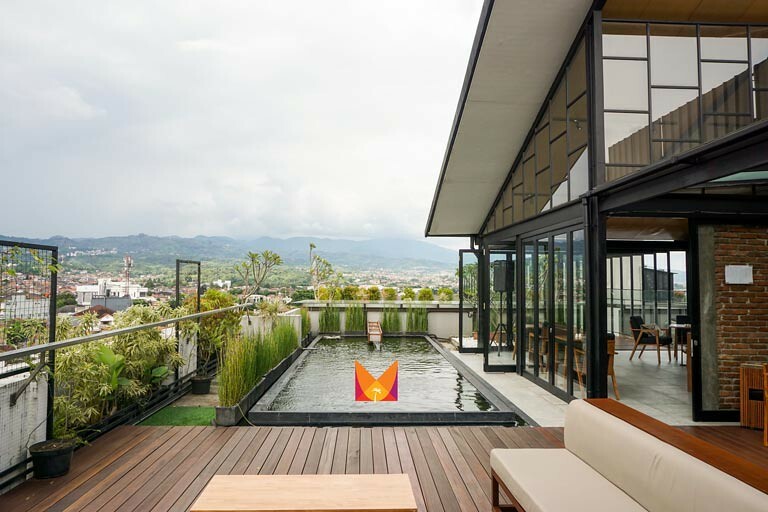 The other thing that I love is absolutely the design of Morning Glory Bandung at Mitra Hotel. Well, you know that I always highlight the design and the ambiance of the cafe or the restaurants rather than its food. When I stepped out from the lift, it was like love at the first sight. On my right, there’s a lonely long wooden chair. This one is a really good spot for your Instagram post haha. Look at the design and structure of the rectangle alley. They use glass to cover this place instead of plain white wall. It’s a good thing as I can see the view from this spot. Pretty, isn’t it? Great spot for your Instagram post haha! Then I walked to the main little house of Morning Glory Bandung at Mitra Hotel. This is the non-smoking section of the cafe, and where the kitchen is located. The house looks just like a regular little-tall-house from inside, but just look it from the outside. It’s much prettier from the outside, especially (again) they use glass as the wall of the house. Outside of this house, there are outdoor seating. One with the long sofa but low table, and the others are regular dining tables. The cute thing is there is a pond, or it looks like a plunge pool to me, but no ones are putting their feet inside the pool haha. Next to it, there is another indoor seating inside a small house, but it’s the smoking room. My friend and I only tried a few foods, one is seafood, then meal with rice, and last one is the dessert. Description: Sautéed beef with korean sauce on steamed rice, topped with “wakame” and “gochujang” sauce. Crown on a plate is a sautéed beef with rice meal. It’s like a fusion food, as I can taste the Japanese food’s taste when I ate the beef, but they also use the Korean sauce on the meal. Why I could say that I can taste the Japanese food’s taste on the food? That’s because I ate sushi on the previous day haha. Anyway, this was my favourite food among the other food that I tried at that time. Description: Squid ink spaghetti with prawn, topped with rocket leaves & freshly grated parmesan. Jet in fog’s mist is a seafood spaghetti. I don’t really eat seafood, so I will ask my friend about the taste of the prawn. Anywho, the color of the spaghetti is black as they use the squid ink on the spaghetti. However, I wish they put some oil on the dish, so it doesn’t feel dry when eating it. Description: Banana with peanut butter and Nutella spring roll. Served with vanilla ice cream. Clumsy nutcracker is a sweet fried banana with vanilla ice cream. As I am an ice cream lover, so I kinda love this dessert. What I love with this Hazelnut creme brulle is because of the caramel on top of the coffee. I still can taste the crisp of the caramel. Sweet! Would I come back to Morning Glory Bandung at Mitra Hotel? Definitely! Would love to try other food on the menu. Anyway, Morning Glory Bandung at Mitra Hotel is quite new, so I believe there will be more addition to this cafe in the future. Don’t want to waste a chance to take a picture here at Morning Glory Bandung haha! Waaa suka banget sama lorong kaca itu. Yes, it is indeed instagrammable! Lol. Thank you banget infonya, koh. Gue biasanya ke Morning Glory di Setrasari yang deket kost hehe, nggak tahu kalau dia punya outlet lain. 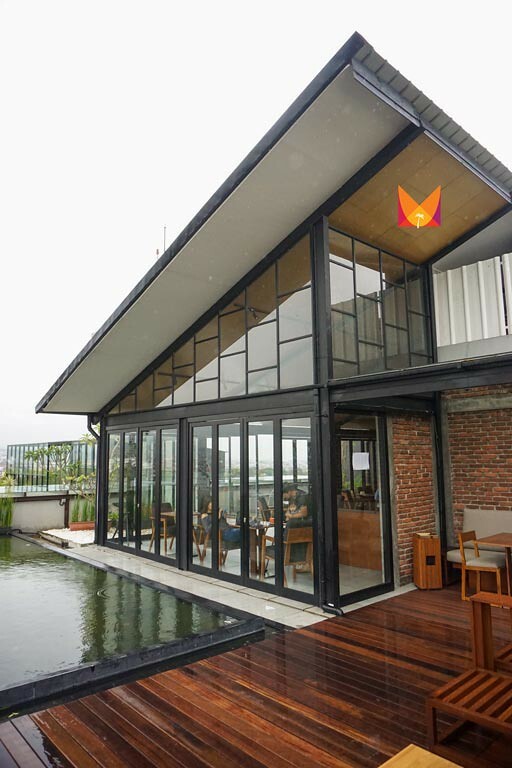 Cantik banget hotel ni Tim! !